Archiving: Would you like to save space & reduce your clutter? 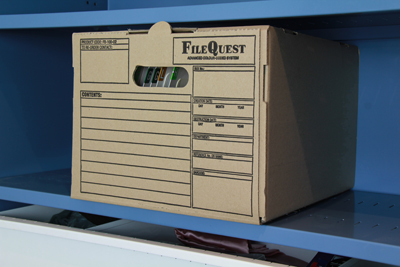 Archives and documents that are not regularly used take up valuable storage space in your office. If you would prefer to free up that space for more productive uses, call us for a quote to securely store your boxes off-site for you. Our storage facilities are secure and fully monitored. The weekly rate quoted to you is inclusive of everything but transport. Your documents can be picked up from you or delivered back to you very easily – they’re just a call away. You can use your own boxes but we recommend the use of our front opening archive boxes which are sturdy, stackable and provide access to the contents from the front.